This section presents a general mathematical framework for representing the shape characteristics of an individual's brain. Since this framework is based on a shape transformation, we first define exactly what we mean by this term. Consider a three-dimensional (volumetric) image, J, of an individual's brain. Let each point in this image be denoted by x x, y, z .A shape transformation, T , of J is a map that takes each point x e J and maps it to some point T x .In the context of our development, x belongs to the brain of one individual, and T x belongs to the brain of another individual. Moreover, these two points are homologous to each other. In other words, the transformation T is not just any transformation that morphs one brain to another, but it is one that does this morphing so that anatomical features of one brain are mapped to their counterparts in another brain. Several investigators have used shape transformations to study brain anatomy [1-6]. However, this approach has its roots in the early century's seminal work by D'Arcy Thompson , who visualized the differences between various species by looking at transformations of Cartesian grids, which were attached to images of samples from the species. Although D'Arcy Thompson, with his insightful analysis, placed the roots for modern computational anatomy, his vision came short of realizing that this technique can be far more powerful than merely quantifying gross morphological differences across species. 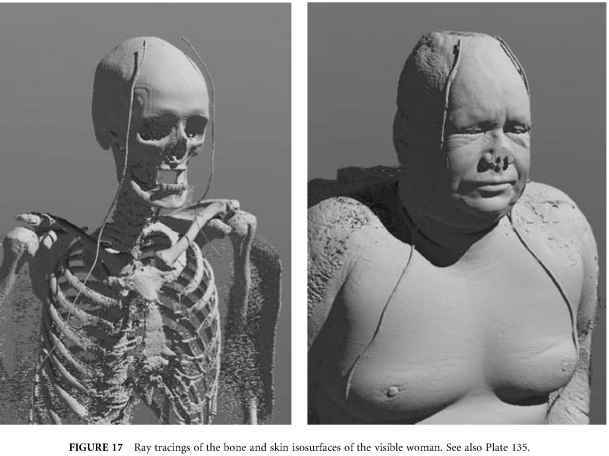 This is because modern image analysis techniques have made it possible to morph one anatomy to another with much higher accuracy than D'Arcy Thompson's transformations. We will see some examples later in this chapter. In order to provide the reader with an intuitive understanding of how one can precisely quantify the anatomy of an individual brain, we will draw upon an analogy from a standard measurement problem: How do we measure the length of an object? Three steps are involved. First, we need to define a standard, a measurement unit. What exactly we choose as our unit is relatively unimportant; it can be the meter, the inch, or any other unit of length. However, we do need to have a unit, in order to be able to place a measurement in a reference system. Second, we need to define a way of comparing the length of an object with the unit; we do this by stretching a measure over the object, and measuring how many times our measure fits into the object's length. Third, we need to define a means of comparing the lengths of two objects; this is what the arithmetic of real numbers does. For example, a 3-meter object is longer than a 2-meter object. Note that we cannot directly compare 3 meters with 15 inches; we first need to place both measurements in the same measurement system. A generalization of the comparison between two lengths, which is of relevance to our discussion, is the comparison of two groups of lengths. For example, we might want to know if nutrition and other factors have an effect on a population's height. Standard statistical methods, such as t-tests or an analysis of variance, will do this, by taking into consideration the normal variability of height within each population. Placing this analogy in the context of computational neuroanatomy, we need three steps in order to construct a representation of an individual's anatomy. First, we must choose a unit. Here, the unit is a template of anatomy, perhaps an anatomical atlas  or the result of some statistical averaging procedure yielding an "average brain'' . Second, we need to define a procedure for comparing an individual brain with the template. In the framework described herein, this is accomplished via a shape transformation that adapts the template to the shape of the brain under analysis. This shape transformation is analogous to the stretching of a measure over the length of an object. Embedded in this transformation are all the morphological characteristics of the individual brain, expressed with respect to those of the template. Finally, the third component necessary for shape comparisons is a means of comparing two brains whose morphology has been represented in terms of the same unit, i.e., in terms of the same template. This can be accomplished by comparing the corresponding shape transformations. Figure 2 demonstrates this principle. In particular, the top row in Fig. 2 shows a synthesized template (left), and two synthesized shapes to be compared (middle and right). Our goal here is to be able to put in numbers the shape differences between these two synthesized objects, using this particular template as measurement unit. The bottom row of Fig. 2 shows the result of a method for doing so, which will be described in the following two sections. In particular, the color code reflects the amount of stretching which the template had to undergo in order to be adapted to each of the two shapes. Red reflects stretching while green reflects shrinkage. Therefore, the color-coded intensity of these deformation functions reflects local size differences between these two shapes. Consequently, one could directly compare the color-coded functions shown in Fig. 2 for two different subjects or populations, provided that the same shape is used as the template (in this case, the shape of Fig. 2 top-left). In the approach described herein, this comparison is performed pointwise, i.e., for each point x e J. FIGURE 2 An illustration of the principle of computational neuroanatomy using shape deformations. The image on the top left represents an anatomical template. The top center shows a hypothetical structure of one individual and top right shows the same structure in another individual. In order to compare the two structures, we use the template as a measurement unit. The amount of stretching applied during the elastic adaptation of the template to each individual shape is shown on the bottom row as a color image, where red corresponds to highest expansion and green to highest contraction. It is clear that the deformation of the template reflects the shape properties of each of the two structures. Since the deformation is defined with respect to the same template in both cases, it can be directly compared across individuals. For example, a pointwise comparison of the deformation for these two shapes would immediately show a relative expansion on the right side and a relative narrowing in the middle for the top-right relative to the top-middle shape. Since the shape transformation of the template to each structure under analysis can be described mathematically, and not simply visually, morphometric analysis of brain structures can be performed quantitatively via such a shape transformation. See also Plate 20.